It should surprise no one that my favorite thing about Aaron Posner's production of King John is Kate Eastwood Norris having the chance to play Phillip Faulconbridge, a strange but juicy part in a play that too few of us have ever had a chance to see. Giving the reins to actresses of the caliber of Eastwood Norris, Holly Twyford and Kate Goehring is a boon to audiences, and one I'm grateful for. What puzzles me, however, is a contradiction between the final product on stage and the vision espoused in Posner's director's note: "We're all excited to have this opportunity to delve deeply into this remarkable play. We won't dwell on its flaws. Not every play can be Hamlet or Twelfth Night, even if you are William Shakespeare." First, stating that we won't dwell on a play's flaws and then citing two of the most popular plays by Shakespeare as counterexamples is a deliberate comparison, tacitly encouraging us to see the play that we've paid good money to see as lesser, which seems unfair. Far more unsporting, however, is that even within the play itself, we are rallied into making those comparisons again, as each battle sequence is played as a mélange of warlike quotes snatched out of other Shakespearean wars. The production itself feels as though it lapses into apology for the play, trying to point to the strengths of its excellent cast even as it pooh-poohs its own text, rather than just letting us make our own decisions as an audience about what we see. In The Fall, a brilliant production out of the Baxter Theatre Centre at the University of Cape Town, we see a dramatization of the events surrounding the toppling of a statue of the imperialist Cecil Rhodes on the UCT campus, and of the student activists who fought, and who continue to fight, to decolonize their education. There is a dangerous fallacy that percolates as older generations begin to despair that the world is not yet free of the evils that we perpetuate through dangerous and hateful systems, a fallacy that provides false comfort: Don't worry, the younger generation will save us. We tell ourselves that their drive and vision and fire and ability to take the best of what we can offer them and move ahead is all that we need. What this does, of course, is to absolve everyone but the young of the responsibility to keep working to make the world a better place. With The Fall, the young artists give us a different perspective. The cast, co-creators, and curators of The Fall tell us through their art that the next generation has the tools they need to save themselves, and to create the art that we all need to see, if we give them the space and the means. They do so through a play that unites music and movement and storytelling to show audiences their story, one so specific to their community that it resonates across the world in performances at Edinburgh, London, New York, and now DC. It reinvigorates us to keep making theatre to better understand our world, and to keep listening to the voices of young people, and we are lucky that Studio has given them the space and our time. Lord knows, must of us in DC can use a break, and there are worse ways to find one than through tap dancing and Cole Porter. 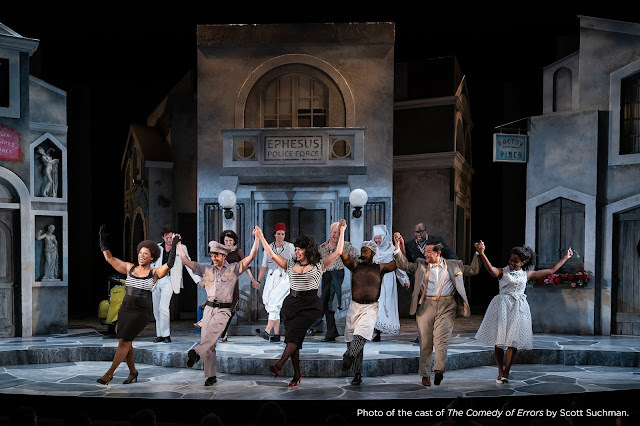 What's a treat, however, is when a production can also remind us of why a time-worn staple of musical comedy can really work. In Molly Smith's production of Anything Goes, late in the first act, we get our first real duet between the primary pair of lovers, played by Corbin Bleu and Lisa Helmi Johanson, as they sing "De-Lovely." It's a song many of us know beyond the context of the musical, but here, we see it work a special and specific kind of magic. As the two lovers sing a cheerful song about how nice it is to be in love, the audience sees the pop of chemistry that we've been waiting for as Hope Harcourt finally lets herself relax and be a woman in love with Billy Porter. They dance, they sing, and they laugh with the giddiness of young lovers, and it's all due to the special kind of alchemy that musical comedy can bring us. There's a reason why we keep producing this show, and its on fine display at Arena Stage.